I would love it if you could go with me to the Boots, Buckles, & Brews Gala event in support of Adoption Options on November 12th. I would like to invite you to join Helen and I at the Boots, Buckles, & Brews Galaon Saturday November 12th at the Arvada Center in support of Adoption Options. I am personally sponsoring the event, so in the comments section of the ticket purchase please let them know you are with me, Chris Gibson. It is an awesome night out WITHOUT the kids. Enjoy gourmet tastings from Haystack Mountain Goat Cheese, special Colorado craft breweries and one-of-a-kind local distilleries. And enjoy the company of other high profile adoption advocates and supporters. Most importantly help this organization continue to match the over 750 children in Colorado waiting for forever families with those families. Adoption Options was integral in helping the birth mother of our kids navigate the legal system and find a caring home for her kids as she struggled with a terminal illness. And they help countless other children, birth parents, and adoptive parents in a wide range of situations and needs every year. I would love to run into you at this Gala and feel privileged to share this worthwhile cause with you. Once again, in the comments section of the ticket purchase please let them know you are with me, Chris Gibson. Don’t wait; there are limited seats available and especially few spaces for the VIP reception. 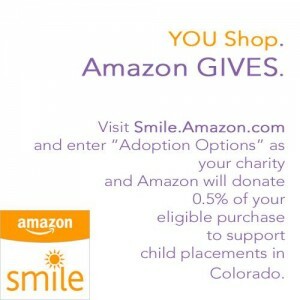 Donate 0.5% of your Amazon Purchases to Adoption Options. With holiday shopping on everyone’s minds, be sure to use Amazon Smile to donate to Adoption Options during this week’s and next month’s holiday sales! How can you donate 0.5% of your Amazon Purchase to Adoption Options? And Amazon will donate 0.5% of the sale to Adoption Options. THANK YOU for making your gifts count in more ways than one this holiday season! 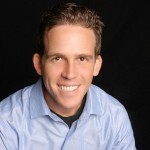 Learn more about what Adoption Options does on their website at http://www.adoption-options.com/ .